GIVEAWAY ALERT! I’m giving away one Kindle ebook to a lucky US reader. Giveaway runs through Sunday 31 March 2019. We all have a list of authors and/or book series that we always look forward to reading. We eagerly await each new release, ready to spend time once more in this world with these characters. The Davis Way Crime Caper series by Gretchen Archer is definitely on my “anxiously awaiting these books…when does the next one come out? !” list. 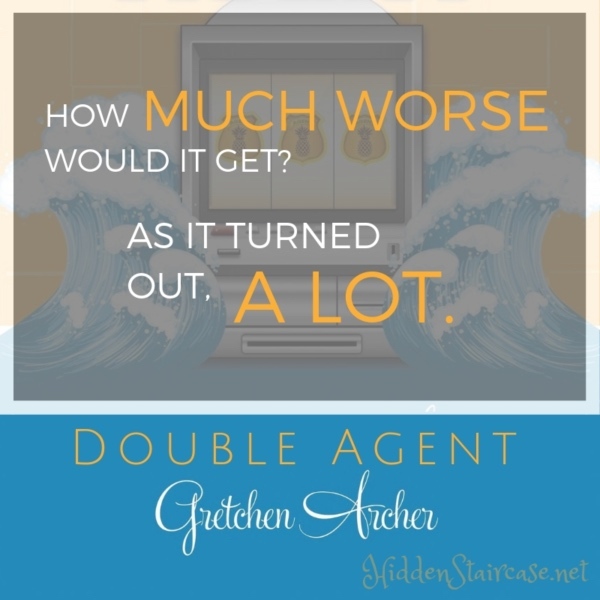 I was so excited to receive an early copy of Ms. Archer’s latest crime caper, Double Agent. I knew before I even opened the book that I was about to be transported to a world filled with “humor, hijinx, and heart.” (OK, the back cover told me that part.) And I was not disappointed. My favorite part about this series is Ms. Archer’s distinct writing style. Each book is told in the first person from Davis’ point of view, and the writing feels so…effortless and natural I guess are the words I’m looking for. (And sometimes even a little punny.) It doesn’t feel like I’m reading a book written by Gretchen Archer. It feels like Davis is sitting with me, telling me all about her latest adventure. The story just flies by, full of funny commentary and small asides from our heroine as she struggles to solve the latest mystery and keep those she loves safe. Davis isn’t perfect…and that’s what makes her great. In this outing, disaster is approaching. Hurricane Kevin is on it’s way, headed straight for The Bellissimo Casino. Guests and most employees have been sent home. Davis (and her family) and a small team (and a few strays) remain to follow procedure to properly shut the casino down before the remaining personnel can evacuate. And if they can’t get it out in time, they’ll have to ride the storm out in Disaster – the secret bunker on the 13th floor of the Bellissimo. As Davis and her best friend Fantasy are scrambling to empty the slot machines, they run into gun fire…and a dead body…and then lose 50 million dollars. It soon becomes apparent that someone is using the impending natural disaster to pull off a heist. And it must be some sort of inside job. The mystery is an intricate and interesting puzzler — how *do* you sneak fifty million dollars out of a locked-down casino? — but as always, for me it’s the characters that take center stage. As Davis investigates, she runs across both old favorites (including Bianca, Davis’ parents, and Eddie the Idiot) and new characters, some of whom I really hope we see again. One of my favorite new characters is Filet, the chef. English is clearly his second language, and his radio calls to gather people for meals might just become the stuff of legend. Ms. Archer made me laugh. A lot. I teared up a little, too. And the closer Hurricane Kevin gets to the Bellissimo, the more Davis sees the true character of those around her. And — for the most part — the good shines through. Above all, that is what I loved most about this book. Great review! Thanks for the giveaway too! I read the first book in this series and loved it, just so funny! You’re welcome and you’ll like that first book telling how it all got started. I need to continue reading the series. 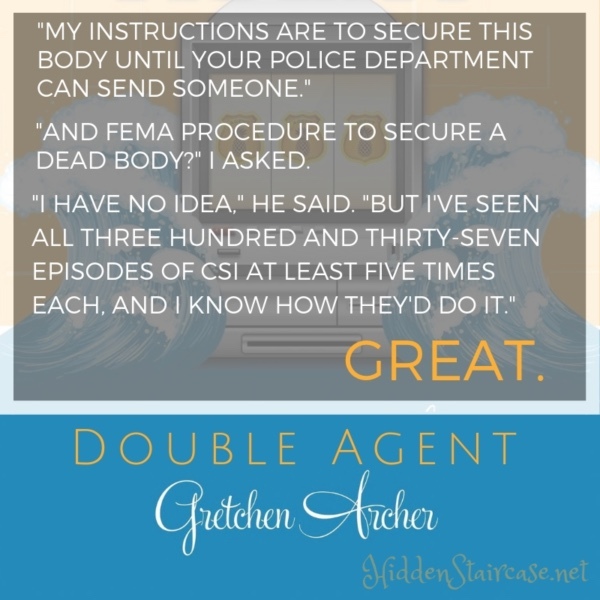 Don’t miss out – I’m giving away a copy of Double Agent to one lucky winner. Giveaway ends on Sunday, 31 March. I agree that these books read very naturally – they play like a TV miniseries in my mind as I go along. I wonder who you’d cast as Davis? Oh wow. That is a tough one. She would have to be funny, have brains, be daring, and have heart. Right now off the top of my head Sandra Bullock is coming to mind, but I need to give this much more thought. 🙂 I honestly have not even thought about it before! Can’t wait to read-love this series and your review pushed to the top of my TBR list! Thanks for the giveaway too-love my Kindle! Thanks for visiting Barb! 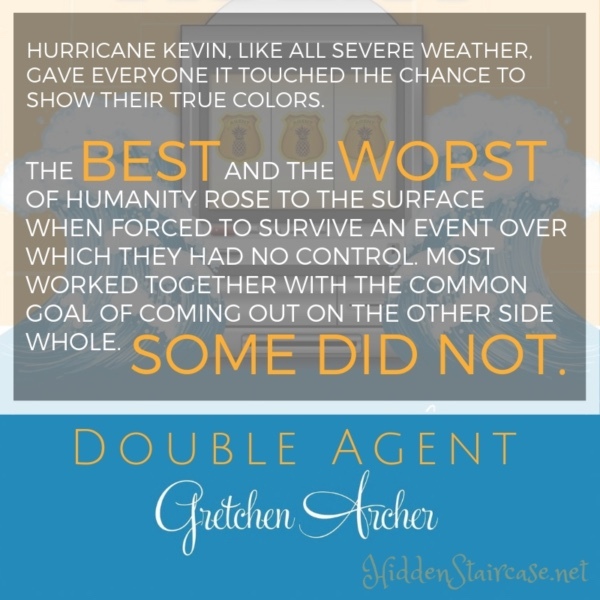 If you love the series you will definitely love Double Agent!